Connacht missed out on a first European Champions Cup quarter-final after this dramatic defeat by Toulouse. A win would have ensured Connacht's progress but Toulouse go through along with pool winner Wasps. Tries from Gael Fickou, Arthur Bonneval and Joe Tekori helped a dominant Toulouse to a commanding 19-3 lead. Connacht fought back and John Muldoon's converted try left the visitors just short of a losing bonus point which would have also taken them through. The Irish side started the day top of Pool 2 but second-placed Wasps, as expected, picked up a bonus-point win over Zebre. That left Connacht needing a win while a losing bonus point would be enough if Toulouse did not earn a winning bonus point. It looked bleak for Pat Lam's team midway through the first half as Toulouse powered their way to a 14-0 advantage at the Stade Ernest Wallon. Fickou touched down after sustained pressure before Bonneval burst down the line to score a second converted try for the hosts. Craig Ronaldson's penalty put Connacht on the scoreboard but lock Quinn Roux was shown a yellow card for a deliberate foul four minutes before the break. Jean-Marc Doussain missed the resulting penalty as Toulouse went in 14-3 ahead at half-time. Toulouse extended their lead to 16 points when Tekori rumbled over for an unconverted try seven minutes into the second half. Connacht showed their resilience and determination with a fightback which came close to clinching a place in the last eight. Skipper Muldoon charged over on 54 minutes and Ronaldson added the extras to leave Connacht within a penalty of securing a losing bonus point. Connacht were now the team with the momentum but their attacks were thwarted by infringements, poor handling and excellent Toulouse defending. 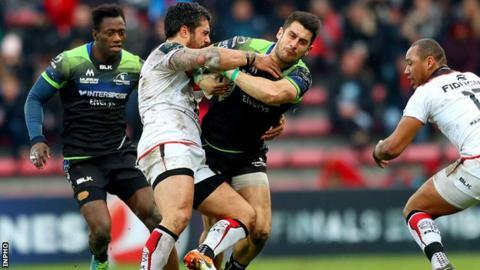 Toulouse survived to make the quarter-finals while Connacht ended their campaign in third place. Toulouse: Huget, Bonneval, David, Fickou, Perez, Doussain, Bezy, Baille, C. Tolofua, Johnston, R. Gray, Maestri, J. Tekori, Dusautoir, Cros. Replacements: Kakovin for Baille (65), Ghiraldini for C. Tolofua (67), Galan for J. Tekori (67), Faasalele for Cros (70). Not Used: van Dyk, T. Gray, Flood, Palisson. Connacht: O'Halloran, Adeolokun, Robb, Ronaldson, Healy, Carty, Marmion, Buckley, McCartney, Bealham, Roux, Cannon, Fox-Matamua, Heenan, Muldoon. Replacements: Poolman for Adeolokun (62), J. Cooney for Marmion (74), Heffernan for McCartney (64), Andress for Bealham (74), O'Brien for Fox-Matamua (62). Not Used: J. Cooney, Dawai, Farrell.